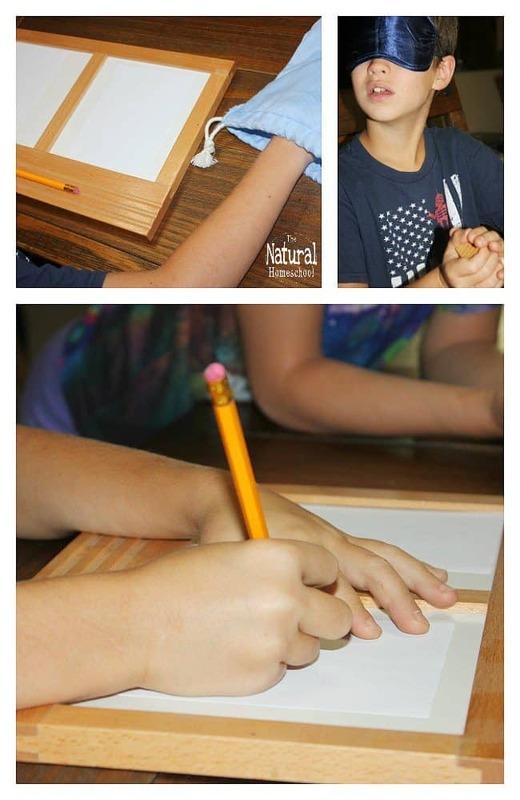 We love doing Montessori at home! We’ve been at it for 7 years now! Wow! Time sure flies by! 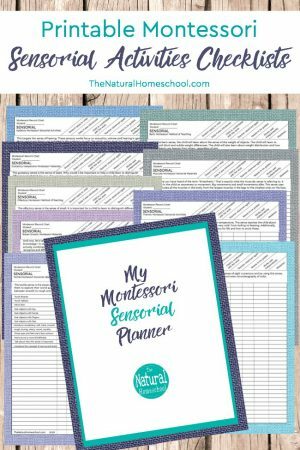 But by now, we are pretty comfortable in it and enjoy helping families out there that are also wanting to include the Montessori Method in their homeschooling. In this post, we show you an easy, but very profound Mystery Bag Lesson. It includes an introductory lesson and two extensions, aside from the main presentation of this Sensory work. 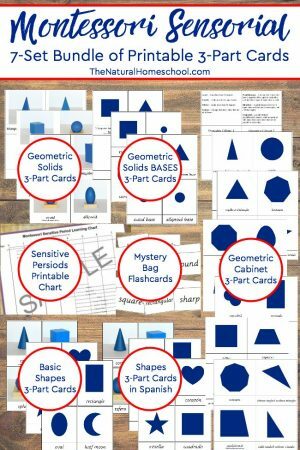 And we also include a set of printables that will help you with this lesson. 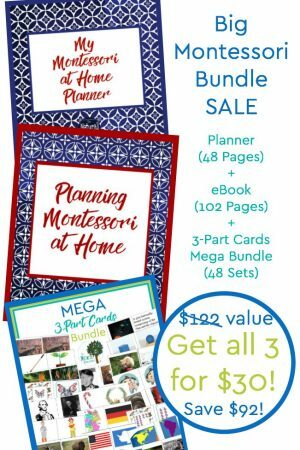 Many parents are looking for free Montessori lesson plans to use at home. Well, this is a great activity or you! 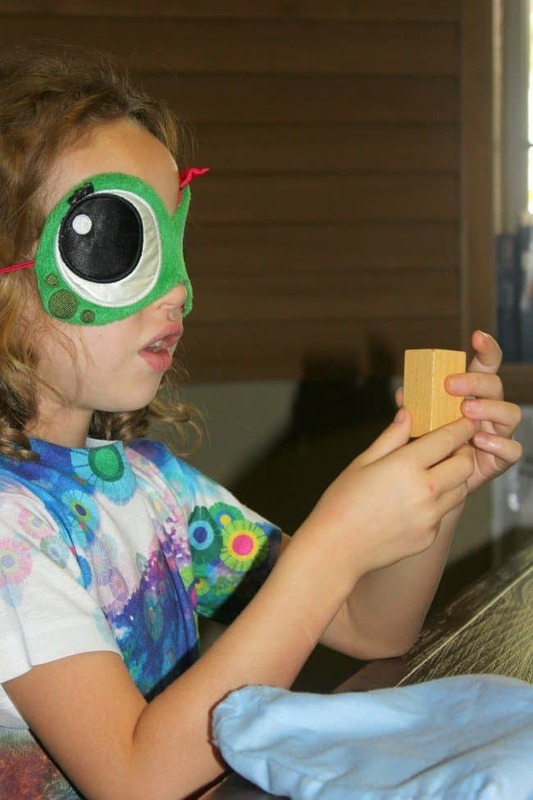 Montessori is for everyone and this Sensorial activity will show you why! 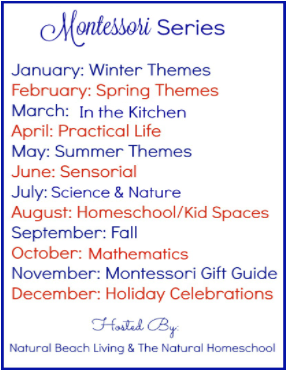 If you want to know more about our free montessori curriculum, click here. 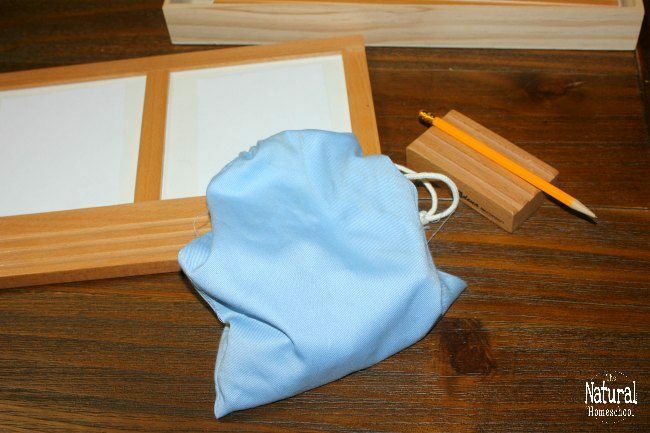 But for this lesson, you need: a Montessori mystery bag, a Montessori inset tracing tray, a pencil holder and a pencil with square papers that fit in the writing frame. Optional: a blindfold. 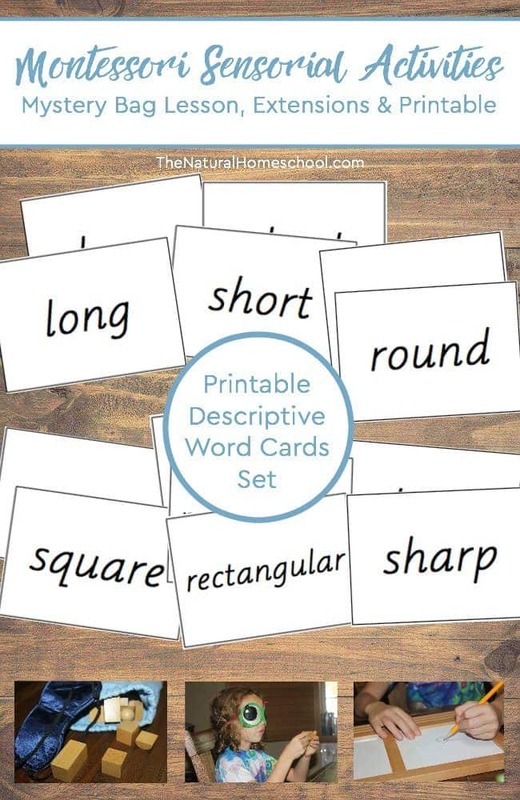 You will also want the free printable set of nomenclature cards with descriptive words. You can find it at the end of this blog post. I decided to do a pre-presentation to the presentation because it was important to me that my children have the vocabulary they need for this Sensorial work. So the introductory lesson uses the free printable that I made especially for this work. It is a set of printable cards that have descriptive words on each. I printed the cards in black ink and on cardstock and cut them out. I then went through the stack with my children, talking about each descriptive words. Some of the words included are round, flat, curvy, sharp, smooth, etc. 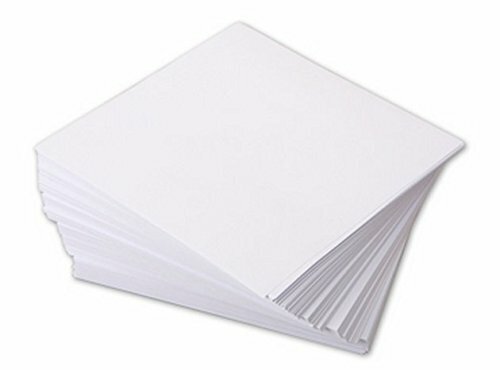 There are many cards, so children will have a great arsenal of words to use here. Once they knew the descriptive words and what they mean, then we moved on to the actual Montessori Sensorial Mystery Bag Presentation. 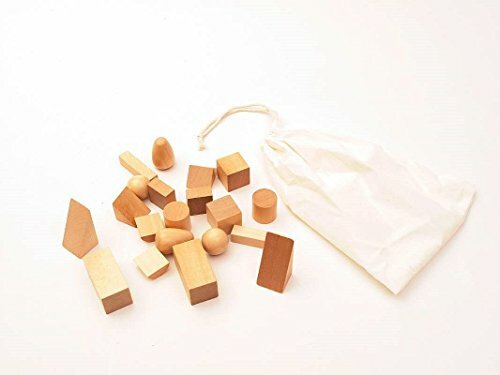 The Montessori mystery bag contains small wooden shapes (two of each), including ovoids, rectangular prisms, cubes, spheres and more. All of the shapes are kept in a cloth bag made out of fabric that is not see-through at all. 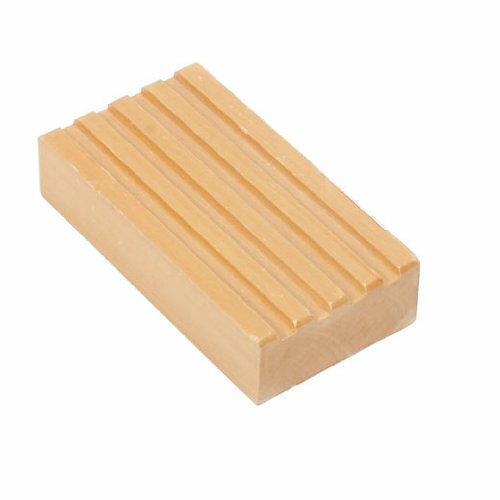 Remember that the Montessori method of teaching is methodical, calm and orderly. For us, it was best for me to introduce this lesson to both my children together, so they took turns with the material. 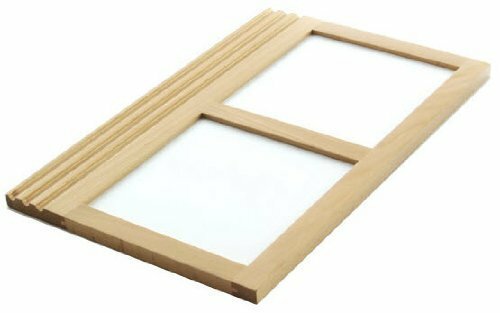 The way you use these Montessori Sensorial materials is to ask the child to close his/her eyes or wear a blindfold and put their hand in the Mystery Bag. Ask the child to pick one shape and take it out of the bag. The child will then use their arsenal of newly-learned words to describe the shape. Once the child has finished describing the shape, they can guess the name of the shape (if you think they know it) then take the blindfold off and see the shape to confirm that they described the shape correctly. 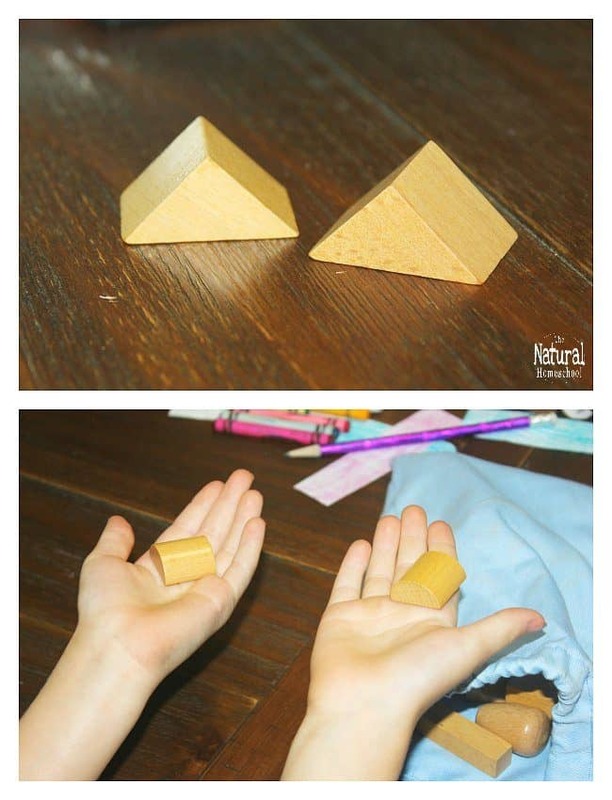 If the child only used one descriptive word, encourage the child to use two more, now that they can see the shape. Return the shape to the bag or leave it out. Do this several time with each child. 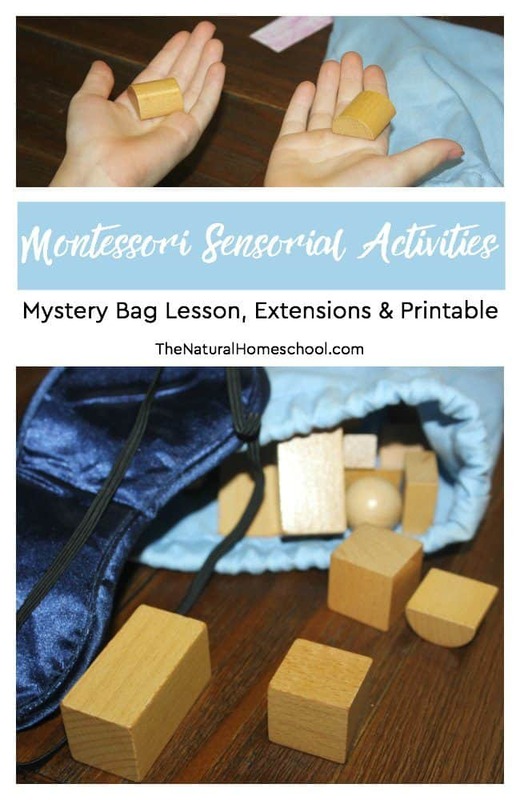 In this Montessori Sensorial sequence of learning using the Mystery Bag, the first extension will be to ask the child (blindfolded) to put their hand in the bag and find a shape. The child will then feel and describe the shape and find the matching shape that is still in the bag. Remember that there are two of each in the bag. The second extension for these Montessori Sensorial lessons is to pick a shape out of the bag without looking. The child will then feel and describe the shape using words from the new nomenclature cards. Lastly, the child will hand you the shape to be placed out of sight. 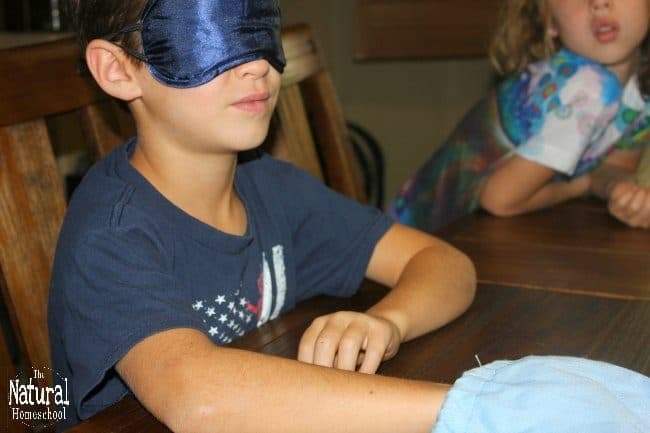 The child will then remove the blindfold and, without seeing the shape, the child will draw it on an inset paper. When the child is done, show the child the shape and confirm that the drawing matches the shape. As an option, you can say the name of the shape and write it down for the child to learn (if they don’t know it yet). You have now arrived to the wonderful Montessori Sensorial area where you can find the descriptive words printable set. 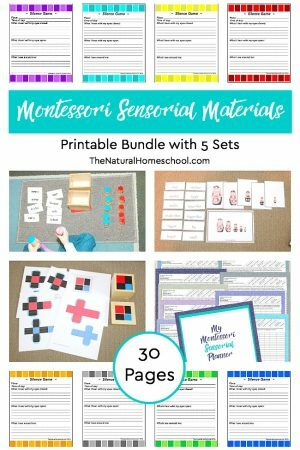 This lesson with extensions uses inexpensive Montessori materials and this freebie is the cherry on top! To get your printable, simply enter your email below and check your inbox for the PDF file download! « Pledge to the Bible Resources ~ Printables, Hands-on Activities and more!